Seal compatibility: Compatible with all normal hydraulic component seal material. Will not dry out seals and Orings , as with other low temp. hydraulic oils. Oxidation resistant (8,000 hours in the ASTM-D943 Oxidation Test): Oxidation inhibitors and premium quality base oils combine to form a product with outstanding resistance to oxidation and provide the maximum protection against varnish formation at both high and low temperatures. This feature will extend drain intervals. Provides excellent anti-wear protection: Special anti-wear, extreme pressure and friction reducing additives provide the highest level of protection against wear and scuffing. Friction reduction: Exclusive friction reducing additives provide reduced operating temperature and reduced horsepower requirements in comparison to other low temperature hydraulic oils. 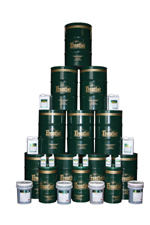 Superior rust protection: Inhibitors protect both steel and yellow metal surfaces against rust and corrosion. High foam resistance: Foam inhibitors provide a high level of foam resistance to prevent pump starvation and damage. High viscosity index: To insure viscosity stability at both standby and operating temperatures.